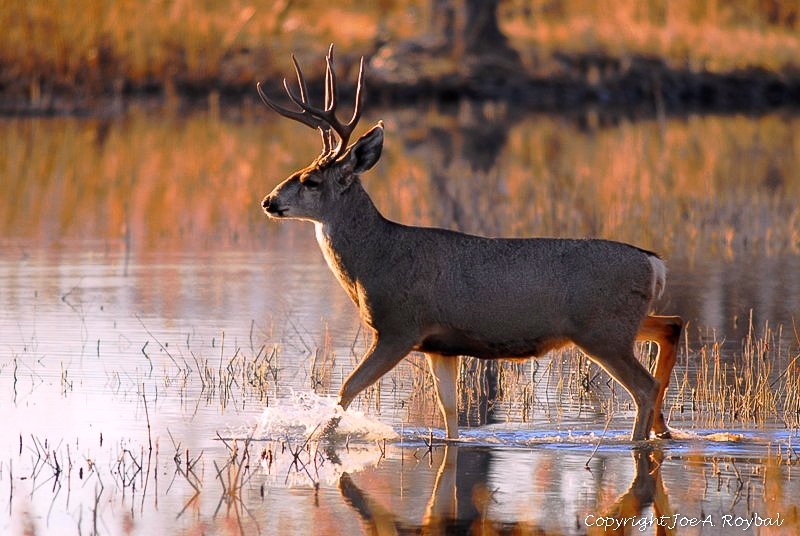 A mulie buck wading in a flooded field at Bosque a few years ago. Nikon D200, 500f4@f4 and 1/500 sec. All C&C welcome. Please click on image. Thanks. Nice lighting, lovely golden tones and good implied movement with the leg positions, Joe. A fine and proud pose from this handsome mulie! Beautiful buck in great light Joe. Nice! Joe, good action with the splashing water, and I like the sidelight with the golden tones. Nice shot. The pretty light really makes this work beautifully, Joe-the buck really glows and the background is full of lovely color. Great colors and interesting light angle, Joe!